My response, which I believe is non-controversial amongst most bond market practitioners, is that interest rate expectations are the primary explanation for the level of yields. (The preferred formulation of a portfolio manager I worked with was “interest rate expectations with technical factors”). In fact, this view is so non-controversial I would guess that many will have stopped reading already (“Well, duh! Time to go back to reading TOP on Bloomberg.”). For those of you who have continued reading, I want to cover some of the less obvious implications of this viewpoint. One simple formulation of the interest rate expectations model is: the yield on a (credit risk free) bond should equal the expected cost of financing the bond at a short-term rate over the bond's lifetime. This essentially is a statement that the bond market is efficient. The initial yield to maturity of a bond represents the breakeven point of the strategy of buying the bond with 100% leverage and holding it to maturity. If we take a 10-year bond* as an example, the implication is that the yield should equal the expected (geometric) average of the 1-day financing rate over the next 10 years**. One should also slap a risk premium into the bond yield, but the assumption here is that this risk premium should be small and stable; for example running around 25-50 basis points or so. In the U.S. Treasury market, the cost of financing a bond overnight (the overnight repo rate) is typically close to the Fed Funds rate, which is supposed to be near the Fed Funds Target Rate set by the Fed. There can be spreads in those funding costs, but they are of the magnitude of dozens of basis points, which is a small residual relative to the volatility in the pricing of most Treasurys with maturities two years and up. Therefore, it is not an accident that there appears to be some sort of relationship between the “market-determined” 10-year yield and the “administered” overnight rate (Fed Funds Target in the U.S.). · how the currency is trading. What may be a surprising theme is that supply and demand don’t matter (e.g. deficits or investor positioning), rather the assumption is that markets are efficient discounting mechanisms for expected returns***. 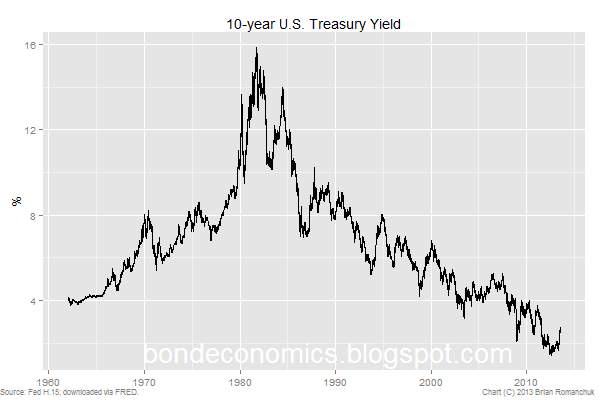 Unusually, “free market oriented” economists, who are typically associated with holding a “markets are efficient” view can quite often write commentary implying the opposite – that fiscal variables can have a major impact on the bond yields (for example). However, the unanswered question is: what determines the expectations for the short-term rate? In the absence of reliable crystal balls, market participants are stuck with attempting to model the central bank’s reaction function. Thus, inflation is only an indirect input to the “model” for bond yields - it only matters if the central bank reacts to it. Of course, since most relevant central banks practice inflation targeting, it should be a relatively important input, but as I will discuss in future posts, observed inflation has not been very relevant in practice for the last 20 years or so. * In the U.S. market, Treasurys with 10-year maturities at issue are officially referred to as “Treasury Notes”, only longer maturities like the 30-year are “Treasury Bonds”. However, I used the generic “10-year bond” (lowercase) for simplicity. ** You need to correct for the various archaic yield conventions used in the bond and money markets if you want to get all fussy about the calculations. ***Supply and demand represent the “technical factors” alluded to in the quote by the portfolio manager above. I feel that these factors are mainly visible in maturities beyond the 10-year point, e.g., 30-year bonds. Even so, the magnitude of these factors are generally quite small, other than for some extremely distorted markets like the gilt market after various pension reforms in the 1990s. As you say the role of expected future short rates is pretty uncontroversial here. However, I do not entirely agree with the dismissal of the of the risk premium as small and stable. This is where the supply and demand come in. For a start, the appropriate level for the risk premium depends on the investor. Households might see longer dated bonds as carrying more duration risk, whereas pension funds might see them as less risky because they are a better match for their liabilities. The level of perceived risk on an asset also depends on how it fits with the rest of the investor's portfolio - if you're already 100% in bonds, then another bonds will feel more risky than if you're 100% in equity. These things all depend on supply and demand and will be impacted by many of the things you list under the 2nd graph. Quite how important they are is difficult to gauge, although I agree they will be less relevant at 10 years than in longer maturities. My own feeling is that, whilst they are not as important as short rate expectations, they are still material. To be honest, my views are somewhat more complex, but "complex" can also be read as muddled. I have to avoid burying my points under a sludge of special cases (which is my natural tendency). The "supply and demand" question is fairly complex, which will be fodder for future articles. The "small and steady risk premium" text is a hook that will turn into a link to a planned future post. I dislike a lot of the models coming out of academia for yield curves where pretty much all the volatility is explained by shifting risk premia. This sort of model behaviour makes no sense to me, for reasons I will explain in the future (yay, more material). Brian, long time no talk. Have you ever done a study to see if the Stone McCarthy Duration Manager's Survey has any information with regards to the future direction of interest rates? Does a survey that tells us bond managers are short duration suggest a contrarian play on the direction of yields? Hi - yes it has been awhile. I don't have access to that data, so I have not done a study of it. I used to have access to it or another duration survey, and I think it sort of worked as a contrarian indicator at extremes. You could pick out those extremes after the fact visually, but to identify those points in real time was the real trick. I am still trying to add data sources over time, and I probably will add the CFTC positions data. I could then see if there's anything I can do with that. (1) The expectations hypothesis gets little or no empirical support. There's a large body of research looking for evidence that current long rates convey information about future short rates, and the results are overwhelmingly negative. (2) The expectations hypothesis does not necessarily describe the behavior of rational investors even in principle. In general, if you expect the price of a long bond one year from now to be X, then the price you should be willing to pay for the bond today will be close to X, no matter what path you expect short rates to follow. That's because if there is a significant change in long rates, the resulting capital gain or loss will swamp the yield in total return. (This is more true the longer the maturity of the bond, and the lower are current rates.) The main concern for someone buying a long bond today is the future path of *long* rates, not short rates. So if market participants believe for whatever reason in a stable long-term level of long rates, then within some limits that belief will tend to validating (i.e. rational investors will have no reason to depart from it), regardless of their beliefs about future short short rates. (3) Liquidity matters, even when we are just talking about Treasuries of different maturities. I probably should look a bit more at the literature. I did my analysis working directly with the financial data and testing out trading ideas. I ran into very little academic literature that was useful for doing my job. (Obviously, market practitioners are paid on the view that markets are not perfectly efficient...) Now that I am writing here, I probably need to pay more attention to the literature. (1) I am willing to accept that the bond markets can do a bad job of predicting the future. But I would argue that forward rates are close to what bond market participants expect (perhaps not economists as measured by surveys, as surveys have a groupthink bias and lag the markets). There is the issue of the term premium, as well. One could argue that my description is tautological, but it is still useful as a starting point. I would note that "physical" bonds - for example, particular Treasury issues - can depart from nice clean forward curves for a number of reasons. Swap curves do not have those problems. (2) Yes, if your holding period is 1 year, for a 10-year bond (swap) you are interested in the 9-year bond, 1 year from now. But what determines that future 9 year rate? Ultimately, it is the path of expected short rates for 9 years. I recognise that "expectations" as an explanation breaks down starting around the 5 year point, at which point "convention" takes over. Even so, those conventions are kept in line by forward rate behaviour. (3) I am in the process of writing about liquidity (which complements your recent article); the article should be out this weekend. Yes, if your holding period is 1 year, for a 10-year bond (swap) you are interested in the 9-year bond, 1 year from now. But what determines that future 9 year rate? Ultimately, it is the path of expected short rates for 9 years. Well, that's one hypothesis. But it need not be true as a matter of logic. It is perfectly possible for me to believe that the short rate will be 3% and the 10-year rate will be 6%, for the indefinite future. If you look at the data over the last 30 years, there is in fact a fairly stable 3 point gap between 10-year yields and the ex post average short rate over the life of the bond. Now, it is possible that investors have consistently overestimated the future level of short rates over the past 30 years. But if the markets can be systematically wrong about future short rates, then I as a rational investor should be thinking more about the expectations of short rates embodied in long rates, than in what short rates will actually be. You are a professional in this area, I'm anything but. But it's certainly my impression that bond market participants do hold definite beliefs about "normal" or "reasonable" levels of long rates, that are at least somewhat independent of what they expect the Fed to do. And people like Alan Greenspan have argued that international arbitrage between long bonds is becoming more important relative to arbitrage between different maturities in the same currency, which would again weaken the expectations hypothesis. Yes, you need to embed what you think the market thinks the term premium should be. However, I believe that the persistence observed term premium is the result of auto-correlated missed forecasts. Nobody believed that short rates could sustainably at zero for years, even with the Japanese yield data easily downloaded. I would argue that it makes no sense to put a 3% term premium on a 10-year bond when the market struggles to keep investment grade spreads near 100 basis points. And if you are an investor that thinks you can do short-term market timing, you are worried about what the long-term rate will be 3 months from now. There are tons of market models that purport to do just that. I am unconvinced that any of those market timing techniques work, which is why I look at intermediate-term rate expectations. There is an investment philosophy behind my discussion, which I will sooner or later write down. "You are a professional in this area, I'm anything but. But it's certainly my impression that bond market participants do hold definite beliefs about "normal" or "reasonable" levels of long rates, that are at least somewhat independent of what they expect the Fed to do." 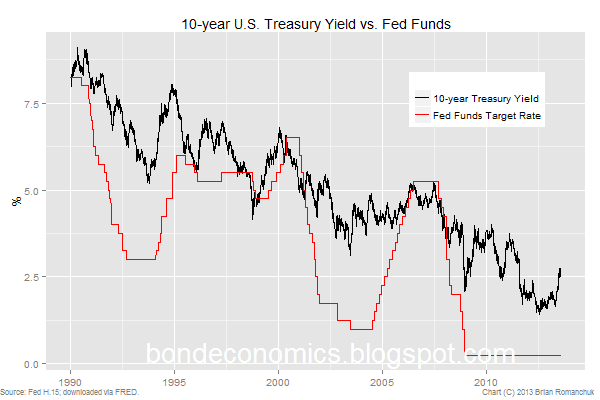 I have seen a lot of crazy theories about interest rates from market participants, to a certain extent my relatively fundamentalist expectations view developed in reaction to that. Obviously, people can disagree with my views. But it is a good starting point, even if people want to debate about things like the term premium. "And people like Alan Greenspan have argued that international arbitrage between long bonds is becoming more important relative to arbitrage between different maturities in the same currency, which would again weaken the expectations hypothesis." The only people who can take FX risk like that on "bond" positions are a handful of macro funds - who have tiny balance sheets, and central banks. Central banks manage their FX exposure based on a number of constraints, plus they tend not to take wild duration risk. Thanks for the responses. This is extremely interesting! So you would say that uncovered interest parity is nonsense, then? Since interest rates in the different currencies are independent, this means that forward currency levels will not have any predictive value for future currency rates (which is what the literature finds, I believe). Obviously, things were different in the Gold Standard, or other forms of managed currencies. In those cases, bond spreads become a means to speculate on potential changes to gold parities. * The currency basis markets started to wobble during the financial crisis, and that got central banks' attention in a hurry. It is the most important market nobody has heard of.